As more artificial flyers enter the skies, they threaten to disrupt ancient patterns and habits of raptors — but what if it were possible to turn the tide. Falcons have existed for millions of years, while drones barely stretch back a century. Furthermore, humans have been training falcons since antiquity, and the birds were widespread enough in Europe by the dark ages that “sixth-century laws of the various Germanic tribes mention fines for the theft or killing of someone else’s hawk.“ Is it possible that, with human guidance, birds could learn to defeat the new unmanned interlopers in their airspace? I most certainly wouldn’t advocate anything that could result in the injury of a bird, and there’s that possibility. My guess is that they’d probably be fine, from what little I know of quadcopters they have tiny little propellers that seem clumsy and flexible, so my guess is that the bird would be okay, but again that’s my very limited understanding of quadcopters and I emphasize very limited, and it’s probably not something that’s worth the risk anyway. You could train a bird to attack a quadcopter, absolutely. But training them to go close to a quad is, I think, very dangerous, with the spinning propellers and whatnot. I’ve trained some of my birds to fly with me in my paraglider, but I will not fly them with me when I fly it powered with a propeller. I think with spinning propellers, it’s not a good idea, because they could get hurt or even killed. Goose is a Gyr/Saker hybird. That doesn’t mean trained birds never interact with unmanned vehicles. Falconers sometimes use balloons with meat dangling below them to train the birds to hunt in the air. But the bird isn’t trained to attack the balloon; the raptor, instead, grabs a lure dangling below the balloon and then returns to its human partner, learning that greater and greater reward comes with flying higher and higher. This training is also done with kites, and at least one falconry supplier even sells quadcopter lures. That lure is attached to a 25-foot long string dangling below the drone, making sure that the bird keeps a safe distance from the drone’s spinning blades. I have a friend who just got a quadcopter and an octocopter, and we tried his quad with my Harris’s Hawks. 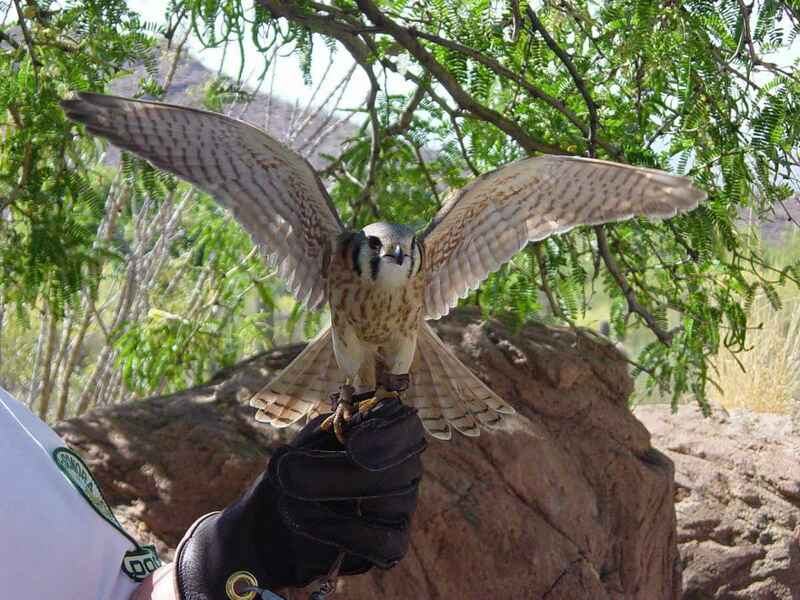 (Even though I’m a falconer, falconry applies to training, flying and owning a hawk, falcon, or eagle.) We didn’t give the birds much time to habituate or get used to it, and even at 100 feet or 150 feet, they were quite uncomfortable with it. Consider the short amount of time that quads have been available and in use. I know that my birds react very negatively to hot air balloons and mylar balloons, and it’s the movement quality of those two item. It’s very different, very unnatural, and one can only assume that a quad- or octocopter can elicit that same kind of response, and that’s pretty much what I observed with my birds the one time I tried it. In the video, the hawk is clearly the superior predator, swooping in for an attack and knocking the drone down. The hawk also appears to fly away safe and relatively unscathed after the encounter, while the quadcopter instead tumbles to the ground. The risk of injury to a bird from a drone encounter certainly seems very real, however, and it could increase as more and more people use drones. But the dangers haven’t yet borne out by arrivals in animal hospitals. I spoke to representatives of both the Lake Milton Raptor Rescue Center and the Raptor Center at the University of Minnesota’s College of Veterinary medicine, and neither could recall any birds brought in specifically as the result of a bad encounter with a drone. It’s likely even possible that with training, birds could become more comfortable with unmanned aircraft. Falcons are high strung and nervous creatures, so much so that they’re typically hooded for transport, but trainers can habituate them by associating unfamiliar objects, like a lure hung below a kite or a balloon or a drone, with a reward. The bird will become comfortable with that lure, and the strange-moving balloon or loud drone might not be so scary after that.